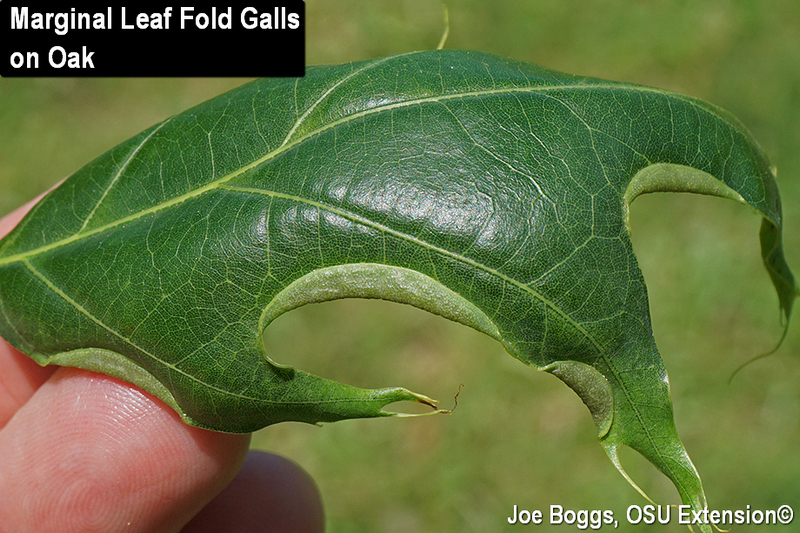 A couple of weeks ago, me and several of my Extension colleagues came across so-called marginal leaf fold galls on an oak on the OSU campus during a photography workshop. Since that time, I'm commonly finding these galls on oaks belonging to the "red oak group" as well as a similar gall on black locust (Robinia pseudoacacia) in southwest Ohio. As with the vast majority of midge galls, the leaf fold galls cause no appreciable harm to the overall health of the affected trees. However, the gall on oak has become notorious for its connection to a non-native predaceous mite (Pyemotes herfsi) that may feed on the gall-making midge fly larvae (maggots). The mite has been implicated in itchy outbreaks in past years in Cincinnati, Columbus, and Chicago as well as various locations in Kansas, Nebraska, Oklahoma, and Texas. I could find no reports connecting the midge fly maggots on black locust to outbreaks of the biting mite. The tiny mites use their piercing mouthparts (chelicerae) to inject a powerful neurotoxin to dispatch the midge fly maggots. They then feed vampire-like by extracting the essence of maggot. When all of the maggots have been killed, or when the surviving maggots drop from the galls to the ground to complete their development, the starving mites drop from the trees in search of food. Unfortunately, the famished mites become "itch mites" if they land on people. They will bite and their neurotoxin induces itchy skin welts that may last for several days. Most bites occur beneath shirt collars on the back of the neck. Unfortunately, research has not revealed conditions that favor high mite populations, so there is no way to predict itchy outbreaks.